If you’re excited to build new bag-making and sewing skills, you’ve come to the right place! Join me for my online class, “MAKING LEATHER BAGS with Don Morin” and learn what you love with video lessons you can watch anytime, forever. I am also recommending some of my favourite bag design classes from my Craftsy colleagues … Brett Bara, Lisa Lam, Deby Coles, Joan Hawley, Janelle MacKay, Angela Wolf, and Annie Unrein. They all have excellent styling designs and tricks of the trade to share with you to make professional looking bags and purses. You may even want to try making one up in leather! Most of all, check out my student projects gallery and be inspired by the beautiful bag creations made from fellow crafters like you. With the holiday gifting season upon us and the fast-approaching BLACK FRIDAY, now is the time to select from the hundreds of online classes offered by Craftsy to give to your favourite crafter and stuff a stocking. With September being National Sewing Month, I’ve been sitting here at my desk, my iPod touch playing my tunes, while trying to come up with some bon mots to inspire you to sew or for many of us (me too) to return to sewing. Thoughts of possibly how to set-up a timetable to sew in our stressful and busy lives, or perhaps seeking a new project to reboot our sewing mojo. Suddenly out of the blue, my playlist shuffles to Lou Reed’s “A Perfect Day”… one of my all-time favourites. I always like to have music playing while I sketch or design. Towards the end of the song, everyone chimes in… “you’re gonna reap just what you sow” but I hear, “you’re gonna reap just what you sew” and I think that is what we need, that ‘buzz.’ That rush of pride in a project that fits like a dream. This is about self-esteem and feeling good about your abilities. Will you have the determination to create today? Isn’t that what sewing is all about? Creating is a choice that asks you to fully be YOU. In everyday life, relationships, parenting, working a crappy job, doing mindless chores, wherever life finds you, your happiness will hinge on how creative you will allow yourself to be. I choose to sew. I choose create. This is what I stand for. It makes me happy! To sew and create is to simply step into how I am meant to be. If I’m going to truly be someone, I better damn well be comfortable being myself. Creating is a courageous struggle against “the way it’s always been.” To bring forth something inside you that’s been waiting for its chance to speak, to influence, to be heard. To truly do good design is to pay attention. We’re living in a wonderland of design. To create is to simply take notes. Look beyond the world around you and observe. Sewing for sewing sake is lack-luster; it’s static yet it can elate you with its results. That is the joy! I don’t want to just listen to music. I want to hear it. To feel it. To let it seep into my bones like a sponge. I don’t want to listen to a thousand songs. I want to truly sing just one, … possibly “A Perfect Day”. It’s easy to follow given instructions. It’s hard to create your own. To create is to take the best of who we are and let it find a home within a medium. Mine just happens to be textiles. What’s yours? Creating is to infuse our purpose, personality, and potential into the work set before us. Luckily, I get to work at my dream job. To live as an un-creative is to mindlessly consume life like it’s a tray of packaged cafeteria food. The world will be inherited by those who can see it differently than everyone else. I don’t want to design pretty things and sew them together. The only way to make something truly unique is to first relinquish what everyone else perceives it to be and make it your own. Sewing is not my profession but it is the method I use that allows me to create. Creating, at the core, is telling the truth. It’s honesty at its rawest form. It’s scrapping your knuckles. It’s wiping the tear-drop. To create is to present something to the world that you’ve been 100% present within. Creating is not impartial. When you create, you are taking a side. You are making intentional choices. You are taking a stand. You are committing through form, medium, brush, song, written word. Every choice is creating meaning. Every creative choice is arguing a point without having to argue. It’s hard to create something new if you’re hoping to be validated in the process. Don’t expect everything to go smoothly, don’t expect everything to be perfect. Try new things, try new ways of doing things. Experiment and solve problems that arise. Maybe your last make(s) left you feeling flat? It didn’t turn out like you’d expected and you missed that rush of satisfaction that we all crave. I’ve been there plenty of times, especially when I first started out and most of my sewing ended up in the bin. So be gentle with yourself. This is the most important rule, in my opinion. We are our own worst critics, and it’s easy to fall into the pit of “I can’t” or “I should have”. I wish I could remember who told me: “Don’t should on yourself.” (say it out loud – get it?). ‘Should’ is such a helpless word. The past has passed; there’s no changing it and no use in thinking about what you should have done. Think instead of what you will do now. Try to create new habits with a gentle heart. Return to sewing if you currently are not consistently sewing at all, maybe make your goal to schedule it as you do for chores and other obligations in your hectic life. Once you get into the rhythm of making time for yourself, even if it’s only 20 minutes at a time, up the ante for your goal and try taking time for yourself five days a week. Before you know it, you’ll be taking those 20 minutes daily, feeling efficient, and seeing progress on your formerly stagnant sewing projects. As a designer you have to “go there” even if you have no idea how you’re going to get out. Embrace sewing and feed your passion for it. You’re gonna reap what you sew! 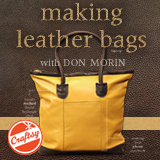 As you know I am a Craftsy affiliate member and offer my on-line class, MAKING LEATHER BAGS with Don Morin, using the Craftsy platform. It’s my chance to have you follow along with me as I start with a few pieces of leather and turn it into a design-it-yourself totebag. So many of you have signed up with Craftsy and have gone beyond my basic “working with leather” demonstrations and created unique handbag designs of your own. I’m so proud of you. Click on the gallery link below to explore more from bag makers like you… and if you want to join along with these creative people, you can go to my STORE section and sign up to my class as well as those of my colleagues at Craftsy by using my affiliate links. You’ll find some great bag-making classes from bag design experts Brett Bara, Lisa Lam, Jan Hawley, Annie Unrein, Nicole Vasbinder, Betz White, Sara Lawson, Janelle MacKay, Kathy, McGee, and Caroline Fairbanks-Critchfield . Weight-training offers a good metaphor for scheduling creative work. No one can’t predict whether or not you’ll set a PR (personal record) before going to the gym. In fact, there will be many days when you’ll have a below average workout. Eventually, you’ll figured out that those below average days were just part of the process. The only way to actually lift bigger weights was to continually show up every Monday, Wednesday, and Friday — regardless of whether any individual workout was good or bad. Creating design work is no different than training in the gym. You can’t selectively choose your best moments and only work on the days when you have great ideas. The only way to unveil the great ideas inside of you is to go through a volume of work, put in your repetitions, and show up over and over again. Never settle on the first-go. Obviously, doing something below average is never the goal. But you have to give yourself permission to grind through the occasional days of below average work because it’s the price you have to pay to get to excellent work. But the alternative is even worse: if you don’t have a schedule forcing you to deliver, then it’s really easy to avoid doing the work at all. The only way to be consistent enough to make a masterpiece is to give yourself permission to create junk along the way.